In 1979, science fiction writer L. Neil Smith created the Prometheus Awards, to honor libertarian fiction. A panel selected F. Paul Wilson's Wheels Within Wheels as the best novel, and a gold coin then worth $2,500 was presented to Wilson. Due to the cost of the award, and lack of a formal organization, the Prometheus Awards fell into limbo the following year. 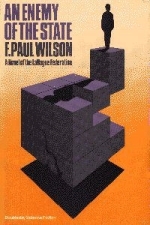 Founded in 1982 to provide encouragement to science fiction writers whose books examine the meaning of freedom, the Libertarian Futurist Society revived the Prometheus Award for best libertarian novel of the year. LFS began in 1982 sponsoring the annual Prometheus Award for Best Novel, and in 1983 a second annual award called the Prometheus Hall of Fame Award was added. The Prometheus Hall of Fame Award is designed to honor classic libertarian fiction. The prize for both the Prometheus and the Hall of Fame awards is a gold coin, representing free trade and free minds, mounted on an engraved plaque. Originally, for the Prometheus Best Novel Award the coin was one-half ounce, for the Hall of Fame it was one-eighth ounce. 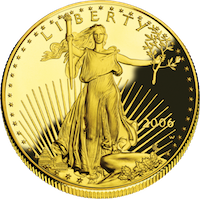 Starting in 2001, the Prometheus Best Novel Award coin became one ounce. 2018 -- Jack Williamson, "With Folded Hands …"
2017 -- Robert Heinlein, "Coventry"
1986 -- Cyril Kornbluth, The Syndic; Robert Anton Wilson/Robert Shea, Illuminatus! 2014 -- Leslie Fish, for a novella, Tower of Horses and filk song, The Horsetamer’s Daughter. sites an affiliate advertising program to earn advertising fees by advertising and linking to amazon.com.